The second line saw some change throughout the year, but for the most part, Kreider, Stepan and St. Louis formed a strong line throughout stretches of the regular season and the playoffs. Coming into the season, I had a lot of expectations for Kreider. After a strong “rookie” season last year, I thought that this was the year where we would see dramatic improvement, and the year where we would see him score 20 goals. And we saw all of that. 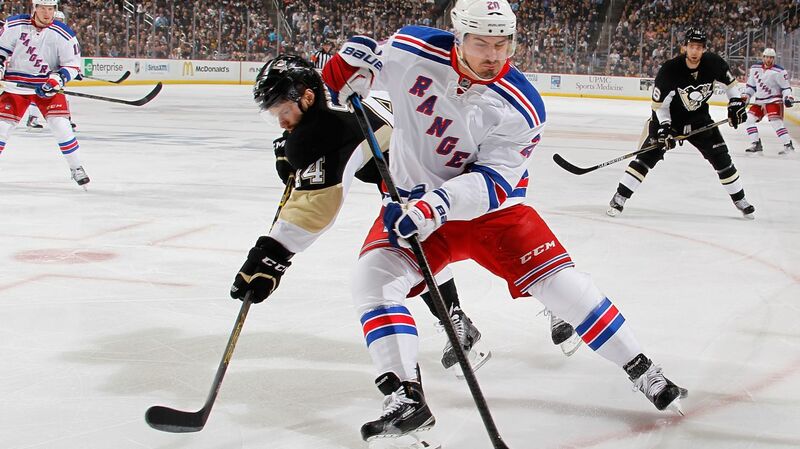 This year, Kreider seemed to put things together and progress more towards a complete game. He has always been a powerful skater, but he really improved on his overall game this year, including his defensive play, his shot, and even his passing. Kreider set career highs in all three offensive categories, with 21 goals and 25 assists for 46 points surpassing his marks set in the 2013-14 season. It was the first time in his NHL career that he had 20 goals and 40 points in one season. His skating, which was always a strong point of his game, seemed to get even better. He was constantly blowing past defenders, using his speed and strength to outpace his defenders and then hold them off for a scoring chance. He has great hands too, meaning that he can quickly deke out a goalie or get a good shot on goal. One goal in particular come into mind when trying to describe his strengths. 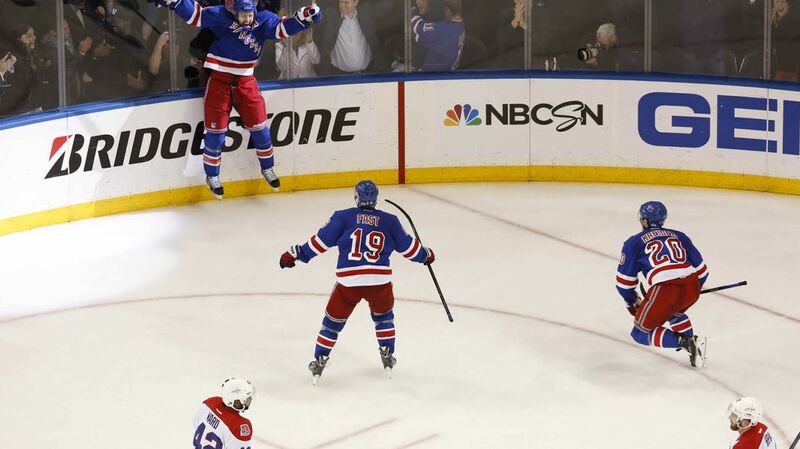 Kreider was an absolute monster during the playoffs as well, most notably in the series against the Capitals. The line of Kreider, Stepan and Jesper Fast was probably the best in that series. His goal in Game 5 with just 1:41 left in the game saved them from elimination and sent the game into overtime, and he followed that up with two first period goals in Game 6 set the tone for the game. In that series, he was invaluable. The one issue with Kreider is that when he isn’t scoring, he tends to disappear for long stretches. Kreider needs to work on being a more consistent player, and letting the beast come through on every shift. He plans on visiting a sports psychologist during the offseason to work on his game, and you can read about that HERE. Overall, it was a big step up for Kreider this year. 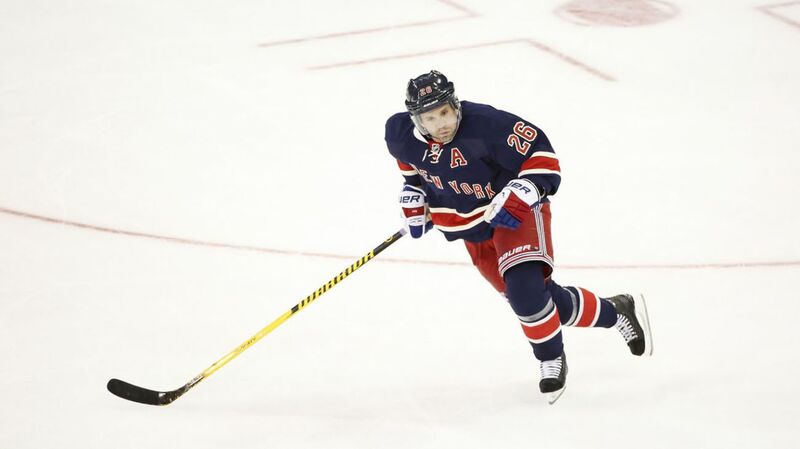 He improved in all areas of his game, and has a future as a top six forward on the Rangers and in this league. Once he learns to be more consistent, and bring that intensity to every game, he’ll be an elite forward. I truly think that he could have a good year and score 30 goals. That’s not my expectation, but there is no reason to think that it can’t happen. Coming into training camp, Derek Stepan was expected to be the number one center in between Rick Nash and Chris Kreider. That line played together for nearly the entire 2013-14 season. But Stepan broke his leg during a conditioning workout, and missed the first part of the season. Derick Brassard stepped up in his place and wound up taking over that role completely. As soon as he came back, he had an impact on the team, improving the overall forward defense, and adding points nearly every night. For the first two months or so, Stepan was averaging around a point per game, and his presence could be felt on the ice. When he was playing, the Rangers were playing better. He missed 14 games, and still managed to total 55 points, but two shy of his career best 57 points that was set last season. If he was healthy for the whole year, he could have easily been pushing for a 65+ point year. Stepan’s versatility is one of the things that makes him so special and important to the team. He’s used on the power play (3 PPG, 7 PPA), is very effective at even strength, and is one of the team’s best penalty killers. 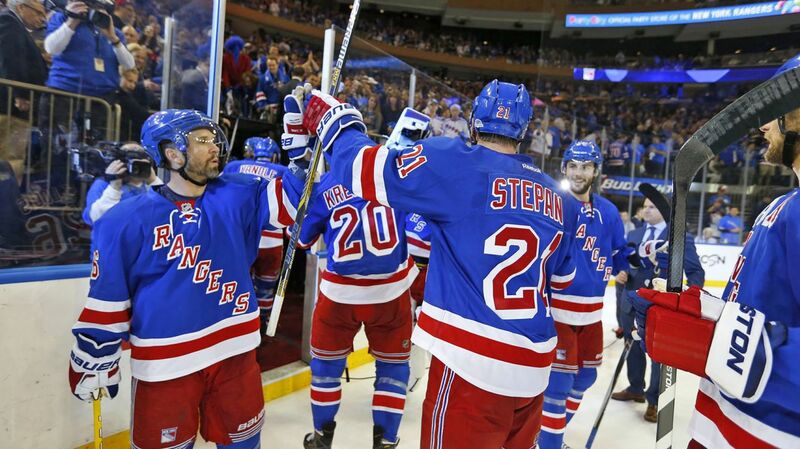 Stepan continued his strong play into the playoffs, finishing with 12 points in 19 games. His most memorable moment was the Game 7 overtime goal against the Capitals, capping off a comeback from being down three games to one. In general, he came through in the clutch when it mattered. Stepan was streaky to end the regular season, going 14 games without a goal at one point, but for the most part, he was one of the most consistent forwards throughout the year. It wouldn’t surprise me in the least if he breaks 60 points next year, or if he wins the Selke Trophy at some point in his career. Martin St. Louis’ first full season as a Ranger, which wound up being his final season in the NHL, was a bit lackluster despite the fact that he totaled 52 points, good enough for fourth on the team in scoring. St. Louis was thrust into an uncomfortable position to start the season, playing center with the injury to Derek Stepan. It’s a position he had not played often, and it’s very different from the game he likes to play. His size has never been a problem, but when taking on the defensive roles of a center, it was hard. When St. Louis shifted back to the wing, he started playing better. The 40-year old winger was second on the team in power play goals (5) and was third in power play assists (8). He was one of just three players to score over 20 goals, and one of only four players to tally over 30 assists. His scoring was a big part of the Rangers offense. However, even though he was scoring a lot of points, you could see that some of his game was deteriorating. His shot wasn’t as accurate, he wasn’t receiving passes as well, and he lost the puck more frequently. Father time is undefeated, and unfortunately, St. Louis showed signs of his age in this season. His struggles were mostly evident in the playoffs, where he was held without a goal until the Eastern Conference Finals, and tallied just seven total points. His offensive impact was extremely limited, getting third line minutes, or even being benched, at times in the playoffs. He simply wasn’t very effective. Although he was streaky at times, and didn’t have a good playoff performance, St. Louis was still a very important part of the team, especially in the regular season. 52 points is nothing to laugh at, and it really helped the Rangers offense. Unfortunately he could not retire a champion, but he ended his career a Ranger, and it was a privilege to have him play in blue for a year and a half. Posted on July 4, 2015, in In the Crease and tagged Chris Kreider, Derek Stepan, Martin St. Louis, New York Rangers, New York Rangers blog, NYR, Rangers, Rangers blog, Rangers Player Grades, St Louis retire, St. Louis announces retirement, Stepan contract extension, Stepan RFA. Bookmark the permalink. Leave a comment.